UCF Student Health Services was established when UCF, then Florida Technological University, first opened its doors in 1968. Since that time, the department has grown tremendously and today averages 6,000 patient visits per month. We provide low-cost health services to the UCF community and are funded, in part, by the student health fee. We are committed to providing the UCF community with quality healthcare, and as such maintain accreditation by the Accreditation Association for Ambulatory Health Care. Our staff includes sports medicine physicians, psychiatrists, gynecologists, dentists, primary care physicians, physician assistants, advanced registered nurse practitioners, dietitians, pharmacy staff, nursing staff, alcohol and other drug counseling staff, laboratory staff, and radiography staff. Departments include Administration, Appointments, Building Management, Dental, Primary Care, Alcohol and Other Drugs, Psychiatry, Physical Therapy, Women’s Health, Sports Medicine, Health Information Management, Laboratory, Immunizations, Business, Marketing, Pharmacy, Nursing, Insurance, and Information Technology. The mission of UCF Student Health Services is to provide excellent healthcare that delivers value and promotes lifelong well-being to the UCF community. To be the healthcare resource of choice for the individuals and community we serve. 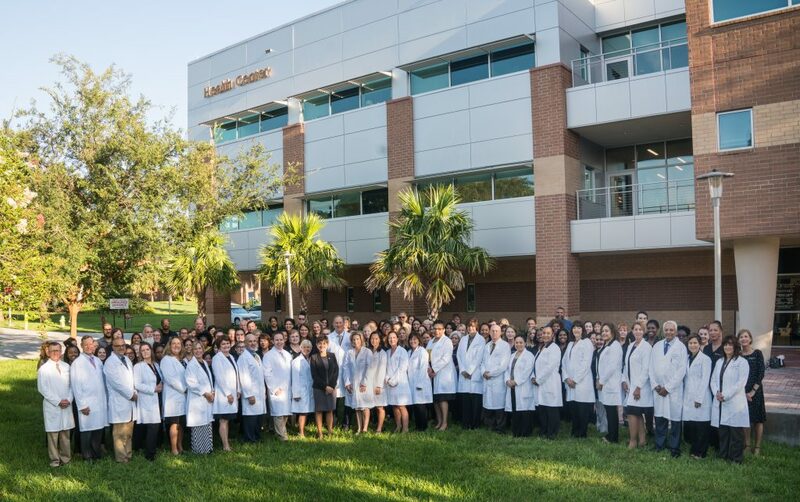 UCF Student Health Services staffs a wide variety of medical providers, including MDs, Advanced Registered Nurse Practitioners and Physician Assistants. Patients can always request whom they would like to receive their care from. If you have concerns about your care, please contact the patient advocate at 407-823-2094. The role of the patient advocate is to ensure that proper medical treatment is received and that each patient is treated with respect. Students are required to pay a state-mandated health fee each semester based on the number of credit hours enrolled. This fee entitles students to unlimited primary care visits without a co-pay or deductible and provides discounts on diagnostic tests, various medical procedures, and medications. UCF Student Health Services is AAAHC accredited. AAAHC accreditation means that the organization participates in an on-going self evaluation, peer review and education to continuously improve its care and services. The organization also commits to a thorough, on-site survey by AAAHC surveyors, who are themselves health care professionals, at least every three years. All administrative and medical positions are posted at www.jobswithucf.com. If you are seeking part-time employment, we hire in non-clinical positions, such as Appointments Clerk, Cashier, Pharmacy Merchandise, and more. If you would like to work in any of these areas, please complete the document below and drop it off in person to the areas in which you would like to be considered for employment with UCF Student Health Services. The managers in that area will keep your resume on file for when a position opens up.